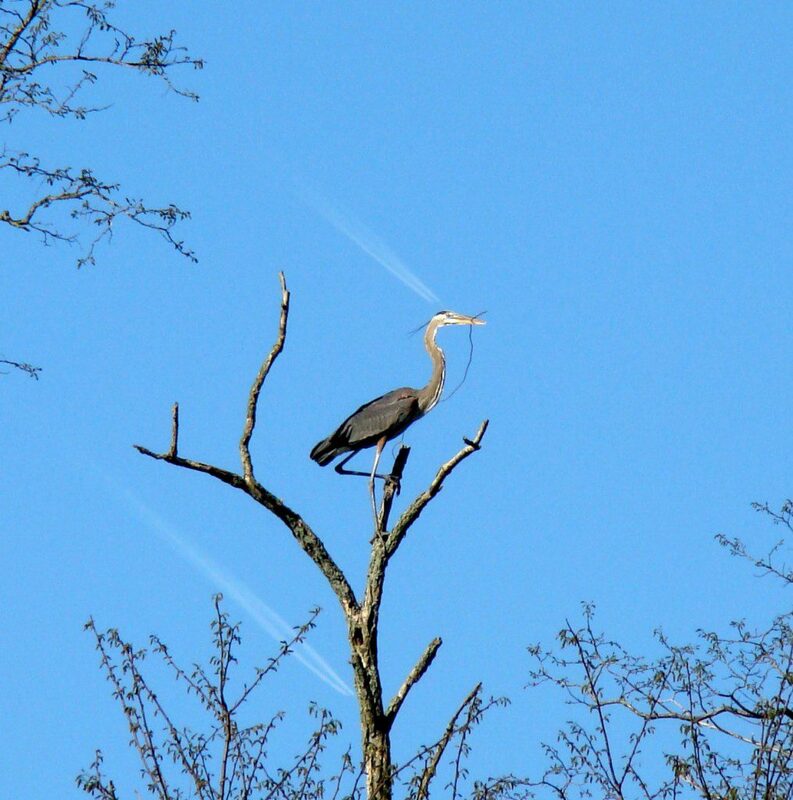 Great Blue Herons are seen commonly along Piedmont rivers, lakes, and ponds. However, where are they nesting? Usually, I assume that in the summer, most that I see around Ashland Nature Center are on feeding forays from Pea Patch Island in the Delaware River, where there is a large nesting population. 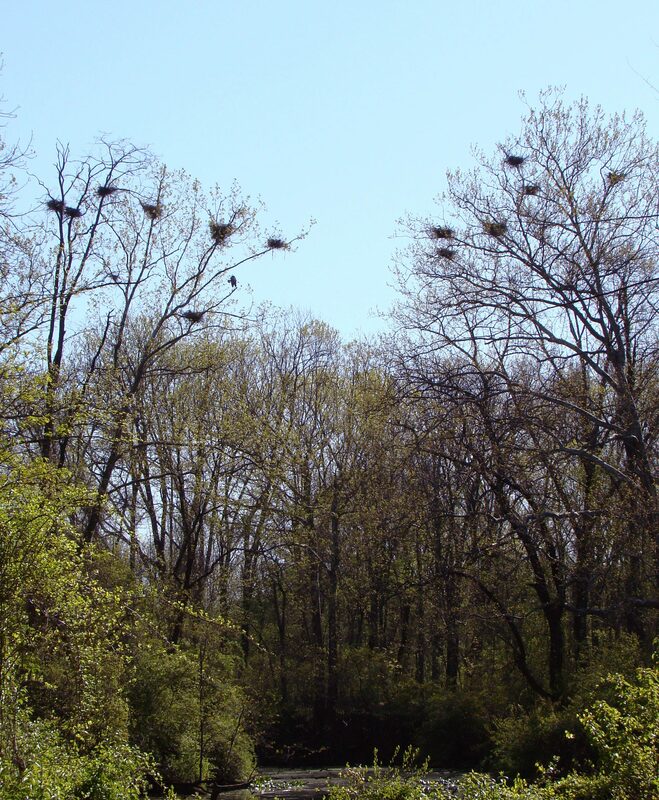 However, the Red Clay Watershed does have its own small rookery near Kennett Square, PA. I led a birding trip to the property this morning to see if the birds were still using the rookery and to look for other birds. Great Blue Herons have nested at this location for more than 10 years. This private property is along the west branch of the Red Clay Creek. When we arrived, we went straight to the rookery site and found 15 active Great Blue Heron nests. Some of the birds were incubating eggs, while others were busy building their nests. A Great Blue Heron pauses before it takes a twig to its nest. The rookery is located on the edge of a woods where there is a 2-acre pond. Why did they choose this site? It did not seem unique in our eyes, but the herons must see something about it that suits them. The Great Blue Herons are nesting at the edge of a woods next to a pond, high up in Sycamore trees. Beyond the heron rookery, we found some songbirds like Brown Thrasher, Yellow-rumped Warbler, Eastern Bluebird and Eastern Towhee. The main advance of songbirds migrating north has not shown up in this area yet, even though based on tree leaf-out, it looks like mid-May around here. Further along, I was a bit surprised to see a HUGE nest. The nest was not here the last time I visted a few years ago. There was nothing in the nest that we could see, but there is only one bird in this area that could have built it…a Bald Eagle. I could not tell if it was occupied or not. Maybe it was built and abandoned, or maybe it was used for only one year. At any rate, this would only be the second Bald Eagle nest that has been found recently in the Red Clay Creek watershed. The other one is in the Delaware section of the creek. An apparent Bald Eagle nest dwarfs an old Great Blue Heron nest. 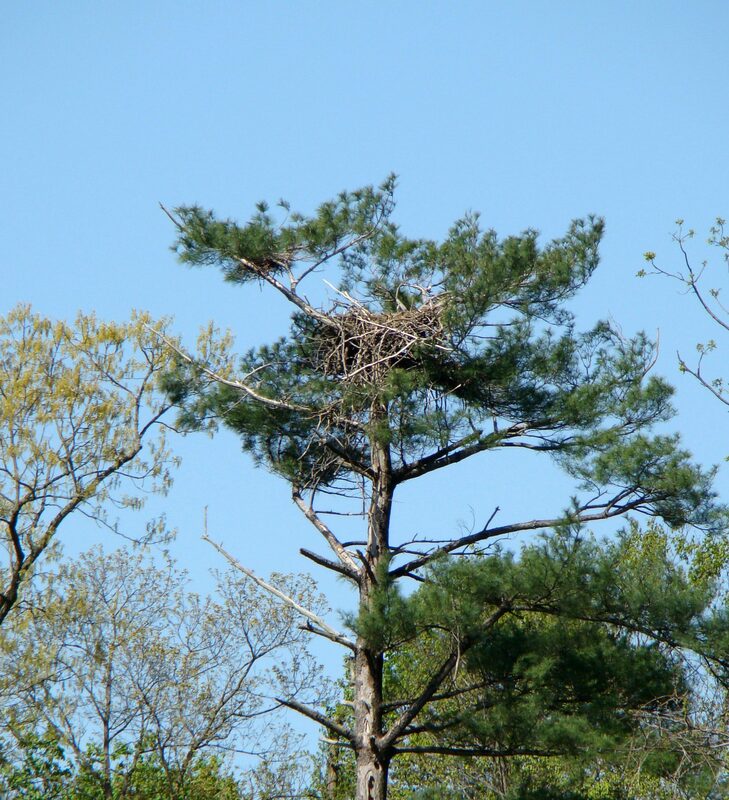 The old heron nest is in the upper left hand part of the white pine. Look for breeding birds in Delaware and contribute your sightings to the Breeding Bird Atlas Project. Visit the Delaware Breeding Bird Atlas page to find out how you can participate in this fun survey that lasts through 2012. 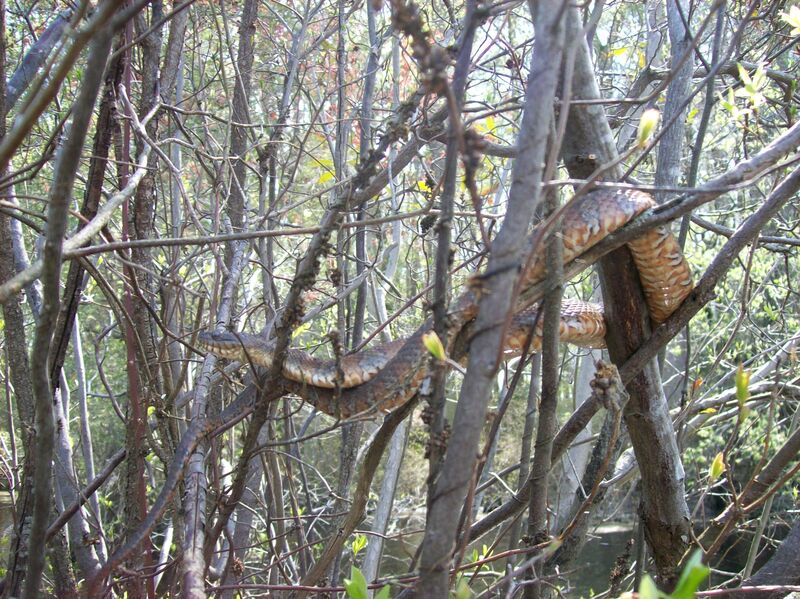 You just never know what you’ll find when you are walking in a forest, and Spring is perhaps the season with the most pleasant sights and surprises along a woodland trail. 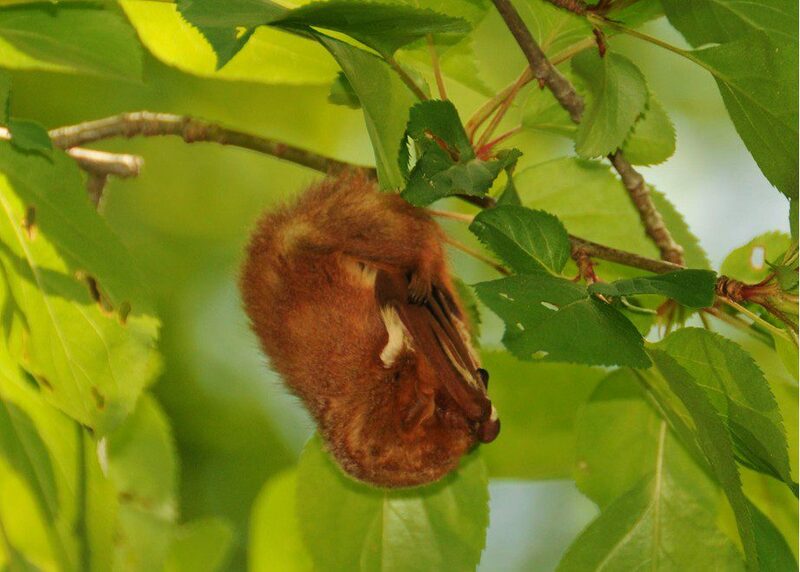 While monitoring a conservation easement this week near White Clay Creek State Park, sharp-eyed Charlotte Greenewalt spotted a roosting Red Bat! The tiny bat, with its tiny head tucked into its wings, hung from its hind legs, upside down in a clump of leaves about 12 feet off the ground. We enjoyed seeing the beautiful white blaze on the chest of this tiny flying mammal. During the same walk, we came across another true treasure: a small colony of Showy Orchis, a rare orchid of Piedmont Woodlands. These tiny wildflowers hoist a white and pink bloom above their glossy green leaves, while looking elegant as only a 4-inch tall orchid can. 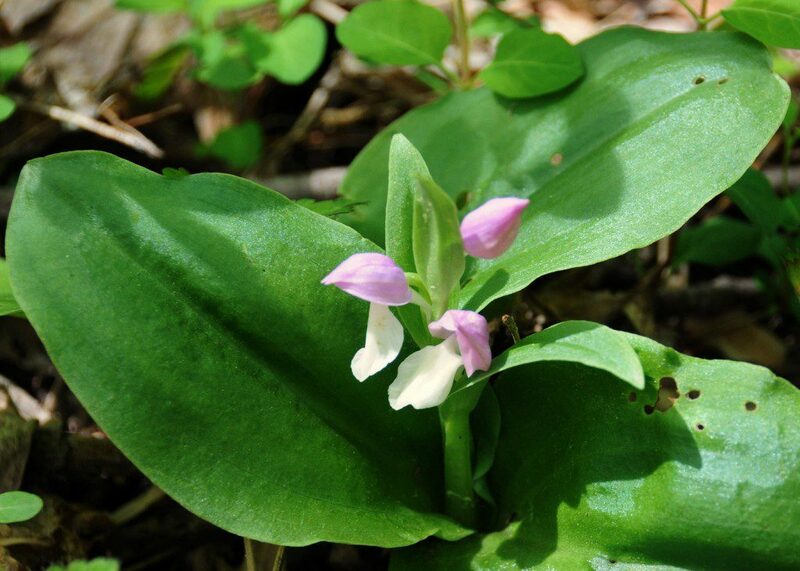 Showy Orchis(Galearis spectabilis) is one of the prize plants to find in the spring, and it is also prized by plant collectors. The novel “The Orchid Thief” profiled the mania which mankind has for the members of the Orchid family, and even our tiny native orchids are not immune to this phenomenon. If you have the opportunity to find a Showy Orchis in the wild, you will see nature’s artwork at its finest. Of course, not just the rare and unusual are of interest to the woodland-wandering observer. 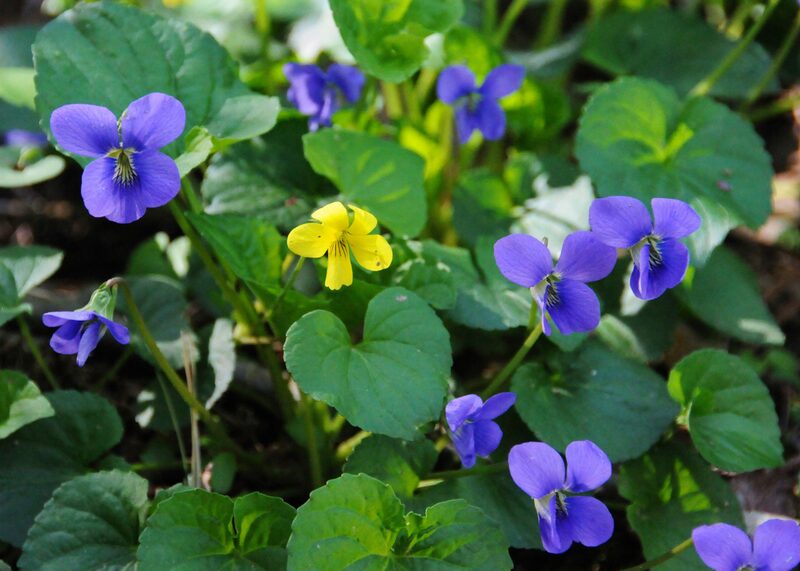 Sometime a simple combination of colors catches your eye, as with this Smooth Yellow Violet(yes a yellow violet!) growing amidst the common Northern Blue Violets. 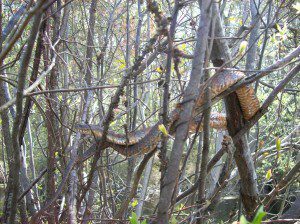 Now is a fine time to explore local woodlands and enjoy the diversity of life that abounds in our native forests– you never know what you will find! Get Back at Stinging Nettle…Eat It! This time of year, there are lots of wild plants that you can harvest and enjoy in recipes. Stinging nettle (Urtica dioica) is one of them, and it is ripe for the picking right now. A favorite of a lot of people, especially in northern and eastern Europe, is stinging nettle soup. It is very easy to make and is highly nutritious with high amounts of vitamin A, C, D, iron, potassium, magnesium, and calcium. If you are going to harvest it in a wild area near where you live, there are a few things you should know. First, be sure that you know what it looks like. The leaves are egg-shaped, with a heart-shaped base, are coarsely-toothed, and are opposite one another on the stem. The stem and leaves are covered with stiff, bristly, stinging hairs. If you are in doubt, brush the plant on your wrist and see if it stings. Don’t worry, it isn’t too bad and it will go away fairly quickly. Harvest the more tender tips of a stinging nettle before they flower. 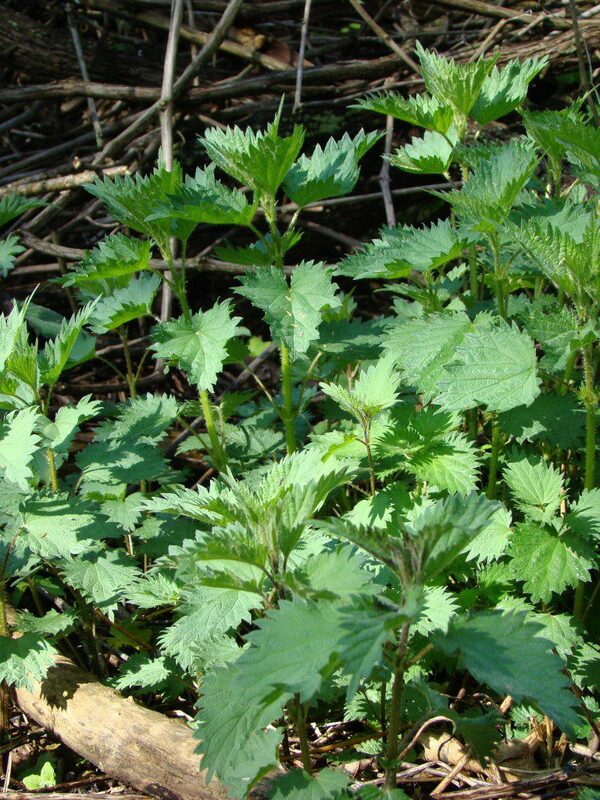 If you are sure that you have found stinging nettle, snip off the tops of the plant and leaves that are not insect-eaten. Be sure to wear gloves! Also, make sure you are not snipping other plants growing among the nettle. You certainly don’t want to include bits of poison ivy or poison hemlock with your soup. Harvest stinging nettle before it flowers for a better-tasting and more nutritious meal. 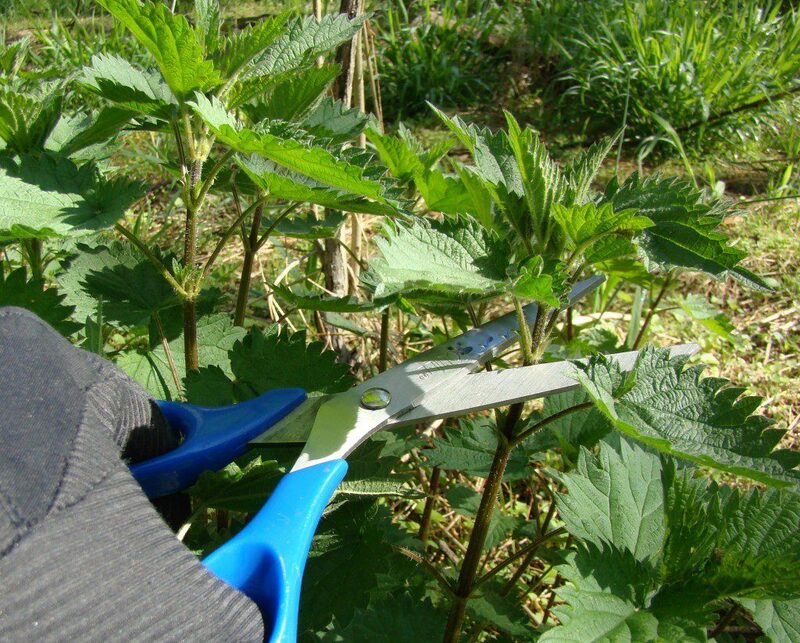 Snip the tender tips of stinging nettle while wearing gloves. Make sure you do not accidentally snip parts of other plants with it, and harvest it before the plant flowers. Next, wash off the nettle in a colander. The soup is easy to make. You will need butter, 1 onion, a few garlic cloves, salt, a few potatoes, 6 cups of vegetable or chicken stock, about 1/2 pound of stinging nettles, pepper, and sour cream or plain yogurt. 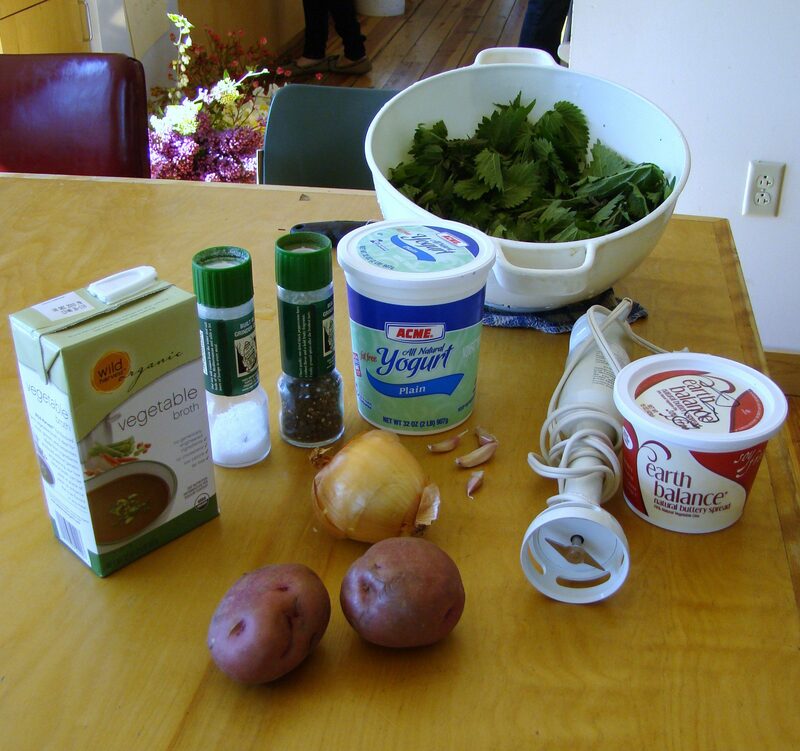 Here are the ingredients you will need for a basic stinging nettle soup. In a soup pot, heat up a Tbsp. of butter and add the chopped onion and garlic and 1 tsp. of salt. Cook for about 3 minutes until the onions are tender. Next, add the chopped potatoes and stock, bring to a boil, reduce heat, and cook for about 15 minutes. Add the nettles, and cook for another 10 minutes until the nettles are very tender. The nettles will lose their stinging quality in the cooking process. Stir in another Tbsp. of butter and some pepper. Puree the soup with an immersion blender or in batches in a regular blender. Season with more salt and pepper if you wish. Serve with a dollop of sour cream or plain yogurt. Enjoy! 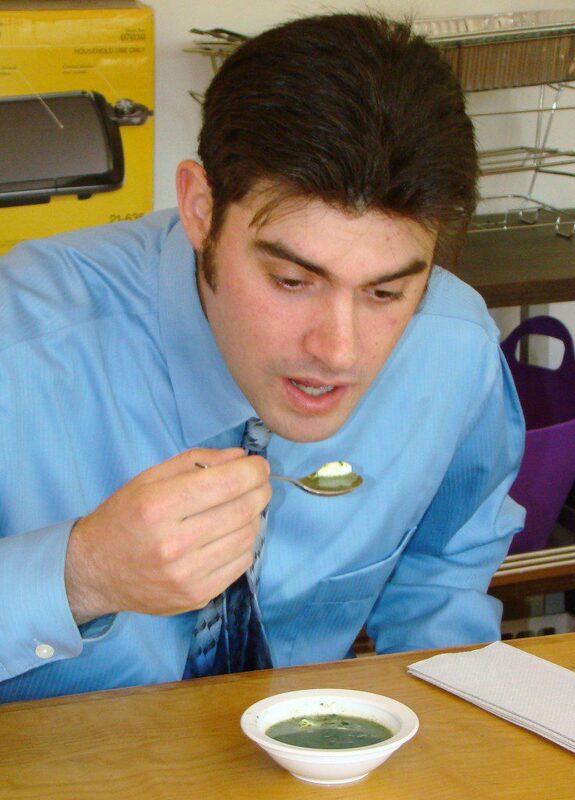 Greg Gagliano, Backyard Habitat Coordinator, enjoys a tasty, nutritious bowl of stinging nettle soup. If you are interested in harvesting wild foods…or just eating them, there are two opportunities through the Delaware Nature Society you might enjoy. 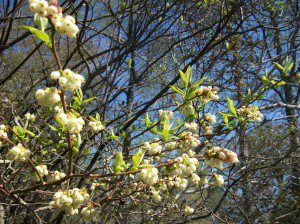 The Native Plant Sale is featuring many kinds of wild edible plants this year. The sale takes place April 29-May 2. Also, we are featuring a Wild Food Dinner at the Backburner Restaurant along with wild edible plant walks with Lee Peterson, author of the Peterson Field Guide to Edible Wild Plants of Eastern/Central North America on Tuesday, May 11. 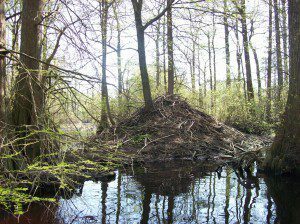 A visit to Delaware’s cypress swamp region is a must for any naturalist. The majestic trees lend a distinctive southern feel while the numerous flowering shrubs, reptiles, amphibians, and birds are sure to capture the interest of even the most casual observer. 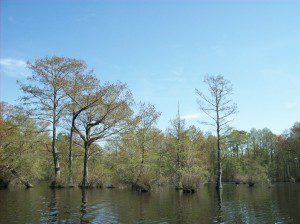 To celebrate this unique habitat, Delaware Nature Society is offering “Cypress Swamp Canoeing” on Saturday, April 17th with groups from both Ashland and Abbott’s Mill Nature Center. Abbott’s Mill Nature Center volunteer Steve Childers and I headed down south to check the access and water conditions at Trap and Trussum Pond preparation for the trip. Both ponds are excellent spots to see and hear early spring migrant birds. Northern Rough-winged Swallows and Blue-gray Gnatcatchers have already returned. Pine Warblers trilled from the pond edge. Though we didn’t see one, the raucous call of the Red-shouldered Hawk is a common canoeing accompaniment. Ovenbirds, Northern Parulas, Prothonotary Warblers, Eastern Kingbirds, and many other birds should be returning soon. 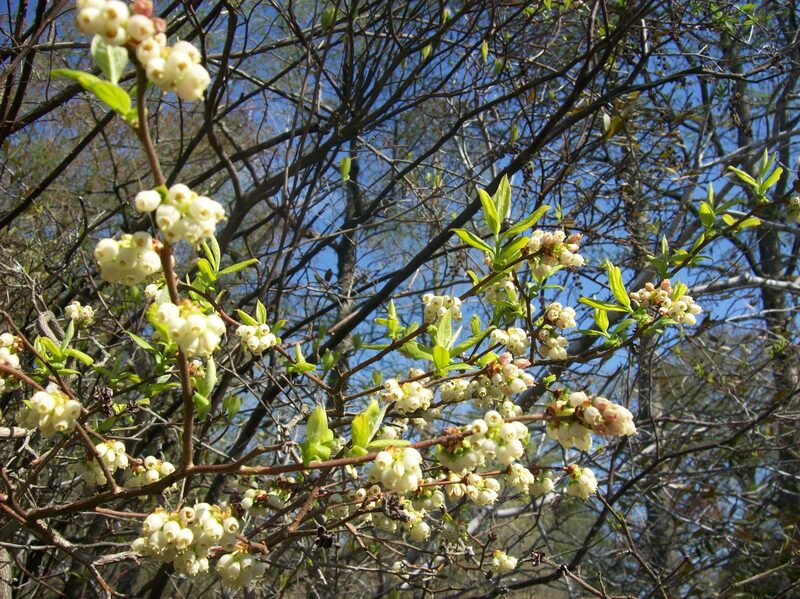 Highbush Blueberry shrubs are flowering from many of the cypress "islands"
The flowers of the Shadbush or Serviceberry fringe the pond edges while Highbush Blueberries and their bell-like flower clusters are common in the numerous pond islands. Both species produce delicious berries enjoyed by both wild animals and humans alike. Many amphibians and reptiles are out and about taking advantage of the warming weather. 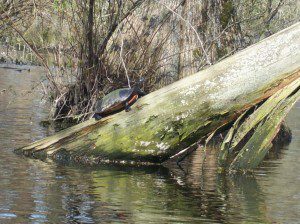 Painted and Red-bellied Turtles are basking by the dozens on any available log. An Eastern Cricket Frog clicked from some lily pads and Fowler’s Toads work the pond edges for prey. Though generally hard to see, American Beaver and River Otter both call the cypress swamp home. Beavers leave their calling cards all over their aquatic homes in the form of cut stumps, debris dams, and of course, beaver lodges. 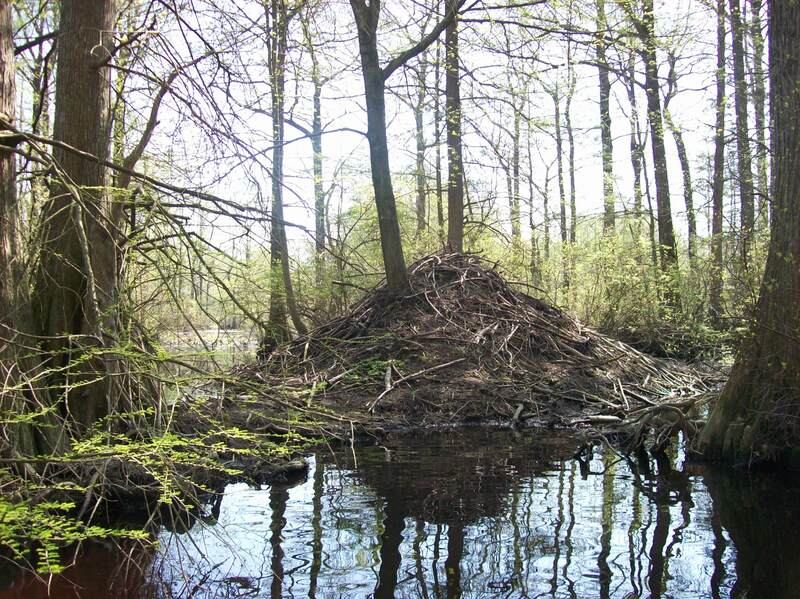 This massive beaver lodge at Trussum Pond stands roughly six feet tall! 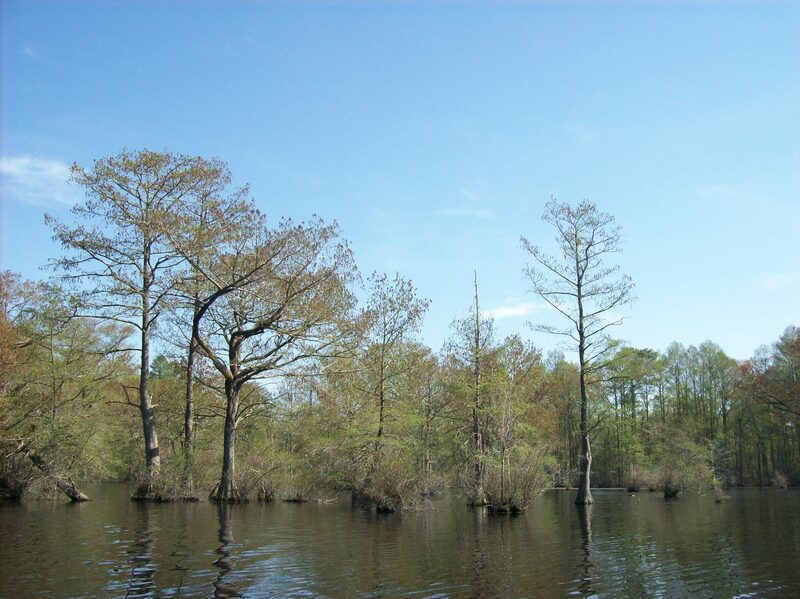 If you are interested in attending the Cypress Swamp Canoeing program, click here.